Transformers: Dark of the Moon is the third in series of the Michael Bay directed Hasbro franchise and is without a doubt the best of all three. The basic outline of the story ties into the cold war era space race. American scientists make a discovery which coerces the United States government into putting a man on the moon. What they discover is a crashed Autobot ship which had fled from the Cybertronian Civil War. The Americans bring back a number of artifacts and lock away their secrets for the next 50 years. The 35 people who knew about the operation are slowly dying in suspicious circumstances. One of the operations most well known collaborators, Buzz Aldrin, meets with Optimus Prime to advise of what they found, what they brought back and why. We start of straight in the middle of a Cybertronian civil war with shells ringing through the air and explosions everywhere. The camera tails an Autobot ship which is being attacked by Decipticon troops. The ship weaves in and out of the skeletal frame of Cybertron making great use of the films 3D. Sadly the ship is shot down by Starscream and floats through zero gravity space before crash landing on Earth's moon. As mentioned previously, JFK makes the decision to send a mission to the moon to find the source of a mysterious signal. Sadly my first impressions of the film, the epic Cybertron battle, were offset by an eye full of lens flair (JJ Abrams called, he'd like his lens flair back) and an odd looking CGI JFK that fell firmly into the uncanny valley. Thankfully things quickly picked up from there. We join Apollo 11 on the moon, a vast, dark and desolate place that looks the norm until the camera pans right to show a downed spacecraft. It is a fantastic "what if" situation that tied in reasonably well to the actual fact of history. The entire cast of characters from the previous movies have returned with the notable absence of Megan Fox and the franchises "Jar Jar Binks", Mudflap and Skids. Rumour has it that Megan Fox was fired due to some offensive remarks made about Michael Bay. Regardless, she has been replaced by another piece of eye-candy in the form of Victoria's Secret model, Rosie Huntington-Whiteley. RHW is not an actress, she's a model. She does a good job of looking pretty but her acting is not entirely fantastic. Shia LaBeouf reprises his role as Sam. My biggest disappointment in the film is that Sam's character hasn't particularly evolved throughout the 3 films. He is still the same wise cracking kid with an attitude that runs everywhere and yells "OPTIMUS!" at the top of his lungs every 5 minutes or so. I'd actually go as far as to say that Sam isn't likeable in this movie due to his attitude of entitlement. LaBeouf is like Will Smith and Tom Cruise in the sense that he seems to run throughout 70% of each of his movies. As an added trademark he tends to get some speed up before sliding like a baseballer into home plate. That being said, Sam is only one piece of the puzzle with fantastic comedic performances by Jon Turturro, John Malkovich, Alan Tudyk, Ken Jeong, Julie White and Kevin Dunn. 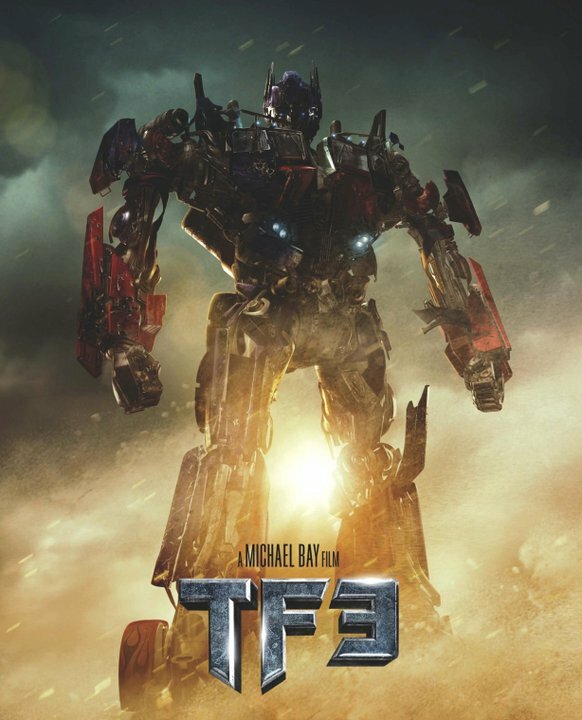 The voice overs are again fantastic with performances by Peter Cullen as Optimus, Hugo Weaving as Megatron, Frank Welker as Shockwave/Soundwave, Reno Wilson as Brains and Leonard Nimoy as Sentinel Prime. It may come as shock to some that Leonard Nimoy would voice a character in Transformers but it should be known that he also voiced Galvatron in 1986's Transformers: The Movie. Transformers: Dark of the Moon is at its core an action movie. Judged purely on this fact it not only ticks all of the boxes but it chews up the boxes and spits them out before setting the boxes on fire. The action is over the top and frenetic. Michael Bay has gone back to his roots and has used 3D technology to its fullest. In every scene he appears to have put a great deal of thought into placing action into the fore, middle and background. Not only does this draw the eye around the entire frame but made me appreciate 3D as being more than just a gimmick. I'd go so far as to say that Transformers 3 has the best utilisation of 3D technology thus far. The CGI in this film is supplied by Industrial Light an Magic and with the exception of the wax faced JFK, the CGI is fantastic. Bay seems to have given the audience a little bit of acknowledgement in that a vast majority of explosions, car crashes and physical stunts are done in real life. Not only is it noticeable but it feels as though he respects the fact that audiences are wise enough to see when the action is real and when it is all computer generated. Overall, Transformers: Dark of the Moon is a fantastic action film. Although reasonably devoid of emotion it gets by from blistering action and a healthy dose of humour that doesn't detract from the overall film. This was an incredibly enjoyable movie that has renewed my faith in one of my favourite movie franchises. Boring action due to a lack of interest in the characters or story. Action scenes ruined by whole movie being shot and edited like a tv commercial/music video. Actions scenes shot zoomed in. Terrible cliche and excessive ad lib dialogue. Excessive misogyny and obnoxious racial stereotypes. Cheesy slow motion shots of characters. Rare use of static shots. Cheesy cliche over-the-top visuals (i.e. key events taking place at sunset or dramatic events taking place behind actors doing routine activities). Cheesy over-dramatic monotonic but intense musical cues during action scenes. Shots of aircraft against a setting sun, especially helicopters. Slow-motion shot of an object crashing into, or tumbling towards the camera. Shots where the camera spins in a circle around characters. Scenes that involve characters running or moving towards the camera (almost always shot in slow-motion). I am trying to contact someone from this blog - where can I find the contact details? LaBeouf certainly seems like the kind of actor to develop all kinds of emotion through the act of sliding into homebase. The film should have been 90 minutes long. The "plot" is the same as the previous 2 movies, nobody believes Sam, then stuff blows up and people start going "hey the kid's right", and then the last third of the movie is stuff exploding. I don't have a problem with Transformers, it's just that a movie based on some freakin toys isn't exactly going to have depth and Transformers 3 gets boring pretty quickly. It's like watching someone else play on your Playstation 3.